The Elders started their journey out of Victoria Harbor aboard this ship. the islanders as part of the 1992 Independence package. and cargo to the island in the 1960s and '70s. New Island's ports of Victoria Harbor and Putney. New Islanders had no idea of how the world worked in 1992. They received very little news of outside events such as the world wars, or that there was a much bigger world out there with its huge cities, mass-market cultures, religions, space travel and the Internet. The Russians helped modernize New Island with dams, roads, railways, architecture and medical care, but restricted newspapers and radios and never introduced television! The island's Elders knew there was definitely something out there. Their information came in mostly via short-wave radio and from a few old friends and contacts in Australia, who never forgot the island during its "off the map" years. So they knew they had to take a tour. They then flew to Melbourne, then on to Los Angeles, and stopped in Chicago, rented a van and drove out into the suburbs. There was no real plan, it just seemed the thing to do. After aimless driving and stopping for fast food, they stayed at a Ramada in Barrington, rented two rooms and watched TV most of the night, while getting a bit high from what they found in the mini-bar. By luck they found their way back to O'hare airport and the van rental agency in time to catch their plane to Ireland, then London. They enjoyed London more than Chicago, and from there (London) they took trains across Europe to St. Petersburg and Kiev, then a long flight to Tokyo, then more train rides to Osaka, and all the way to Kagoshima. Then from Japan they flew on to Melbourne and finally to Perth-Fremantel, and the boat back home. They were exhausted, but they learned a lot of what they did not want to see on New Island. New Island Gains its Independence! original Russian Survey map of 1912,and redrawn in English. On April 13, the island's name was officially changed to The Commonwealth of New Island, and the celebrations lasted for days. New Island's Elders had long ruled the towns and settlements not directly under Russian administration. They used local governing practices more or less laid down by Cecelia, Captain Hayes, Roger Putney and others, but were unprepared to set up a nationwide government, let alone interact with the outside world as a sovereign state! and to help mollify the locals. have been lovingly maintained ever since. Russia's political upheaval from Czarist to socialist governments was slow to arrive to distant Yellow Island since travel and news to the island took several months. 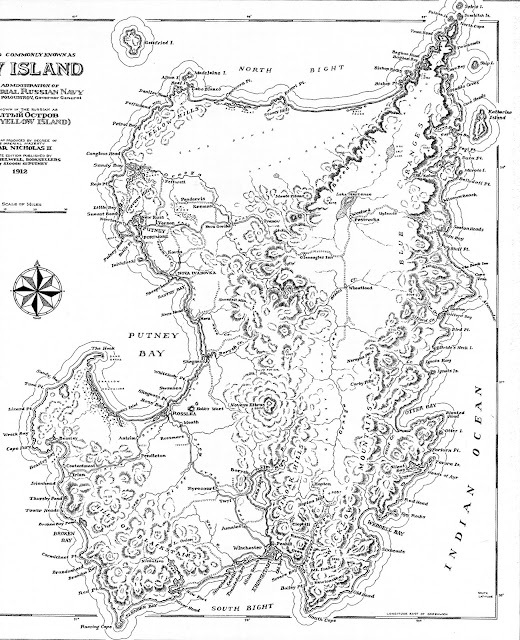 Indeed, in the years immediately following the 1917 revolution the island was nearly forgotten. Meanwhile, Governor-General Poloustrov continued building the island's roads and railways. He was a skilled negotiator and tried to be fair to islanders displaced by the projects. 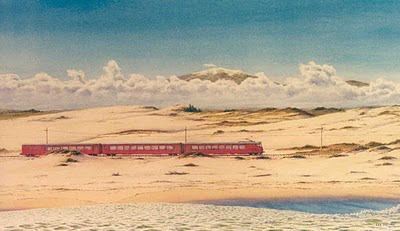 At the start of construction, native islanders had only crude dirt roads and wooden carts for transportation, so they grew to love the trains and were also grateful for the free medical care the Russians provided. Roadbuilding almost became an obsession for a while as every settlement wanted to be connected to the new Russian roads and railways. Local residents readily offered labor in trade for a road to their village. Now farm tribes could easily trade their produce with townspeople and the Russian garrisons. People could wander the island with relative ease. When the Bolsheviks finally arrived, they found the islander culture to be already socialized, so they raised the Soviet flag, changed Poloustrov's title to "Commander" and allowed him to keep his post. As the 20th Century progressed, Soviet Russia's relations with the islanders became more harsh. In the 1930's Joseph Stalin raised the island's export quotas of wool, wheat and fish and replaced Commander Poloustrov with a strict "committee". In the late 1940s land was taken for a secret submarine base and other military projects that were beyond the comprehension of the islanders. To their consternation, islanders were no longer allowed to travel offshore, make international calls, own radio transmitters, or use typewriters without special permission. By 1949 the Cold War arrived on the island and eventually led to its virtual erasure. An American commando unit arrived on a dark night that year, and took the Russians by surprise by quickly cordoning off an area surrounding Desert Point on the island's desolate northern coast. It appears now that the newly organized American CIA had been watching Soviet Russia's military activities on the island and clandestinely set up a fortified tracking station of their own to monitor the Russians. In a hush-hush agreement, the Soviets allowed the Americans to stay in return for denying the island's existence! The Yellow island was then deleted from all published maps in both the Soviet-bloc East and the Capitalist West. It became a Blank Spot in the region, something not that uncommon! Amazingly, it was then completely forgotten by nearly everyone (except the islanders and a few military staffers) for about 50 years. This military presence did have the benefit of Soviet Russia adding more hydroelectric, road and rail service, including streetcar lines in both Putney and Kronstadt, as well as the restricted phone service. As long as the islanders were allowed to live relatively unmolested, they were more or less satisfied. on the Putney Bay shore. Volcanic Mt. Hayes is visible in the distance. Wow, here we are at the Beatty ruins on the North Bight Path. large stone blocks carefully cut and fitted. about three miles south of the ruins. Here is the path to North Cape on a clear day. 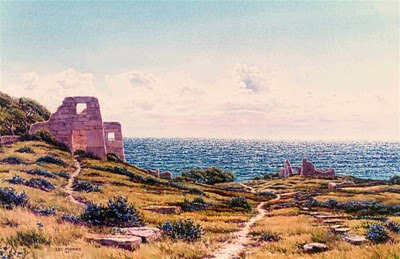 These views of the island were painted by New Island artist Rusty Mothes. wildflowers frequently observed from the ship. The Russians occupied our island until 1992. Eventually the world accepted the fact that Russia owned the island. 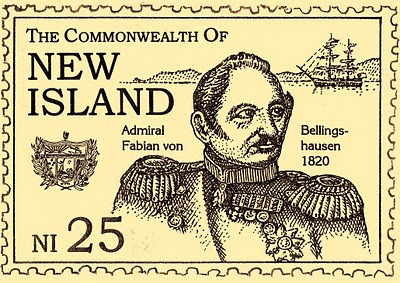 Czar Alexander wanted the island to pay its way and demanded quotas of wheat and wool, which Bellingshausen had reported were being produced by the settlers. The Czar's colonial commanders were pragmatic enough to realize that forced labor would likely bring on a native uprising, thus they agreed to a barter system whereby Russian finished goods would be traded for the island's produce. The Russian administrators, laborers and contractors who had contact with the islanders were usually intimidated by the women's' wild, intense gaze and their 'natural' clothing styles. These newcomers really didn't understand what the islanders were up to, nor did they want to, so they simply left them alone. The abundant offshore whales and sea otters were not so lucky, as they were savagely hunted for their oil and fur. Beginning in 1830, Russian whaling operations were set up near Kronstadt, and Russian ships hunted down the region's whales, seals and otters until they were very near to extinction. This disturbed the islanders greatly as the otters were a sacred animal, and the stench of the offal dumped into Kronstadt Bay was nearly suffocating at times. By 1902 the entire area was fished out and the operations closed down, but you can still see the bleached bones littering the shoreline north of the Marketside district. The southeastern forests were also a target for export. In the late 1880's Russian loggers cut down a considerable amount of local timber for export, especially in the more accessible areas east of Kronstadt. Fortunately, the Revolution interrupted this practice before the major mountain forests were cut. Some tree farms were developed in the 1920's, and New Islanders still practice the methods they learned from the Russian foresters. After 1900 Czar Nicholas began to see the island as a strategic naval base, and in 1906 assigned Governor General Alexander Poloustrov the post of colonial commander. Poloustrov was given the task and a healthy budget to build roads, railways, hydroelectric plants, deep-water ports and other infrastructure to make it a useful outpost for the military, and as a possible resort for the Russian elite. Poloustrov hired Polish and Russian laborers to build these projects, which fortunately neared completion when the Revolution finally caught up with the island around 1920. 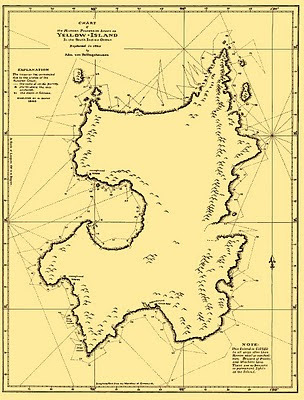 The Russians claimed New Island in 1820. Czar Alexander I had entered the race to colonize distant lands far later than the rest of Europe. In 1819 he sent Fabian von Bellingshausen on an expedition to circumnavigate Antarctica as well as to chart the last 'unknown' regions of the Southern Ocean. 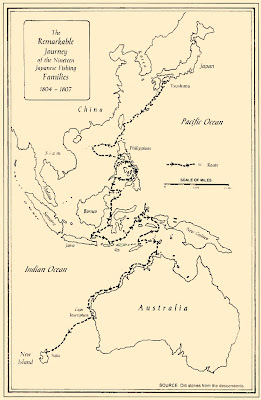 In April of 1820, Bellingshausen headed north from Antarctic waters to Java, to wait out the approaching southern winter. 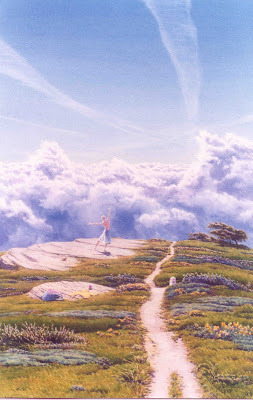 En route he encountered a "...land of a hilly nature with smokes and other signs of settlement." A cautious man, Capt. 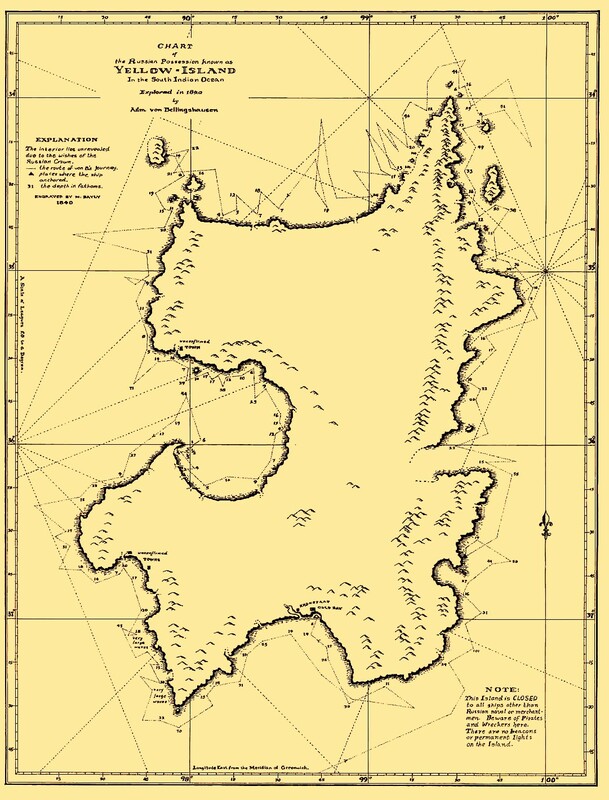 B. decided to sail around the island first, creating New Island's first coastal chart along the way. He finally ventured a landing at Old Bay, on the island's southern shore and near where he first sighted the island. Waiting for him (his progress had been closely watched) was a large group of fair-skinned, English-speaking and rustically-clad locals. By luck, a Russian deck officer spoke enough English to initiate a conversation, and what a conversation! The Russians were immediately impressed by the level of civilization these shipwrecked female convicts had accomplished! The also knew that to maintain any hope of holding on to this outpost from the grasp of the rest of Europe, they would need allies. After two weeks of negotiations with settlement Elders, a unique agreement was reached: Russia would declare the island a sovereign Russian possession, thus keeping it out of the hands of other European powers. 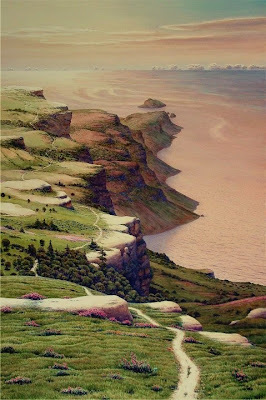 The islanders, in turn, would allow the Russians to use the island's natural harbors as port facilities, and they would also help defend the island for Russia. Beyond this, the islanders and their way of life would be left alone: no Russian police force, no missionaries, and no interference in islander affairs! Russian settlement would be confined to a surveyed area near the two port sites. The Elders were very firm on this and Captain Bellingshausen signed to it. Next: Russian occupation, and some rough times. In 1807, just as the Europeans were settling much of New Island's south-western coasts and valleys, a group of fishing families from Tsushima in Southern Japan landed on the north-eastern coast of the island. Until they hit Australia. They patiently hugged the inhospitable Australian coast and at Cape Inscription, finally decided to follow a "mysterious and delightful light" that led them west to New Island. Here they found their new Eden: a dramatic coastline with good rainfall, not too hot, lots of fish, and nooooobody there to give them grief. They founded the town of Sata, and later a few outlying villages where they could harness streams for rice-paddy irrigation, and also fish. Along with rice and other native seeds, they brought timber bamboo along with them, which they allowed to grow wild on the hillsides. They were completely isolated until 1819 when a group of young women (teenagers mostly) from Elsinore, a new farming tribe to the south, discovered them. After a wary period of shyness, the girls were treated well and soon learned about the delicious local seafood and rice dishes, the furo bath and the marvels of Japanese crafts and architecture--"all so different and all so delightful", the girls reported! Thus relations and trading were established. Japanese fishing and construction techniques were soon known over much of the island, and Buddhist practices, such as zen meditation, became popular--long before they were known in the West! For 21 years, English-Irish convict women, ships' crew and guards; a band of settlers (for a while under the dubious Mr. Denby); and a few Japanese families enjoyed the freedom to create their own lifestyles and their own civilization, something completely unknown at this time. The women, inspired by stories about the "Old Religion" of 5,000 years ago, and other pagan and animist traditions, branched off into many tribes to farm and do things their own way. But eventually one of the Great Powers would claim the island...and by luck it was Czarist Russia. If the British had claimed it, the convicts would have been shipped off to Australia, among other disruptions! If it were the Spanish, French, Portuguese or the Dutch, all with ships crossing the Indian Ocean more and more frequently, who knows how the island would have fared, but the delicate social experiments would likely have been crushed. and a few farm towns inland, as well as many isolated outposts. Women virtually ruled New Island mostly because of their sheer numbers in proportion to the men (about 4 to 1) and because they seemed more adaptable to the turn of events that led them here. Perhaps it was a stronger instinct to survive coupled with a dare-it-all attitude that got them into trouble in the first place! They became excellent leaders as well as capable diplomats, and were far more willing to experiment with living arrangements to insure their survival. Some of the young sailors and guards went along with womens' community-life ideas that were truly radical for the time. The older sailors and most of the military/guard held out and settled into bachelor-villages of their own, hoping to continue some vestige of their previous lives at home. It turned out that a lot of women frequented the taverns these guys had established! The men who joined the women in the new communities, especially those in the emerging tribes, had quite a great time of it, as their services were much in demand. It wasn't long before there were lots of kids being raised by entire villages! Supplies salvaged from the wrecks greatly helped the new communities. Sheep, goats, cattle, pigs and chickens had survived the shipwrecks and varieties of grains and vegetables (from English seed stock) were soon thriving in small fields. Tools and a library of how-to books from the Swallowtail were most beneficial! becoming the first followers of New Island's blog-website. 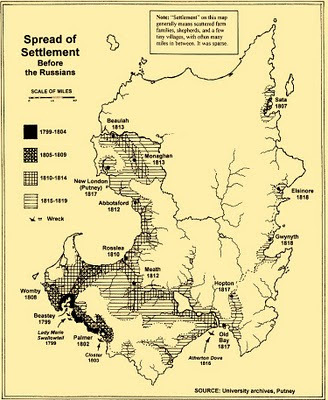 I'll continue with New Island's early history for a while, and keep it as brief as possible. Like everywhere else, what is going on on New Island today is a result of the island's history! 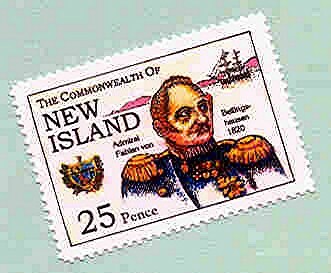 For example, the stamp above is meaningless unless you know what the ship and and the guy in the uniform are all about. This is third grade stuff in New Island schools, but we're catching up!